We hope that you’re doing well while enjoying more sunshine and warmer weather. In keeping with June being Men’s Health Month, we’re pleased to provide you with some of the latest Prostate Cancer News You Can Use. Titles of recent articles about prostate cancer are listed below followed by a link to the Us TOO web page that provides access to the full text. The following additional items may also be of interest to you. If you haven’t yet visited the Us TOO Prostate Cancer Inspire Online Support & Discussion Community, check it out at: www.ustoo.inspire.com. There’s no charge to join for access to online posts categorized by 15 prostate cancer topics. Expand your knowledge and share your experience by posting a question, answer or comment. If you’re in Rochester, NY, on Saturday, June 17, join Us TOO for a Community Conversation: Prostate Cancer and You! It's a free event that provides an overview on informed decision making for PSA testing, active surveillance, treatment options for all phases of prostate cancer from newly diagnosed to advanced, and management of side effects. CLICK HERE for all the event details. As you plan your online shopping for Father’s Day, graduations and weddings, please remember to shop AmazonSmile. It provides all of the same merchandise that’s available on Amazon at the same price; but designates a portion of your transaction to benefit Us TOO. Simply select Us TOO International as your charity of choice and 0.5 percent of the value of all purchases will be donated to Us TOO. There’s no limit to the amount AmazonSmile will donate. CLICK HERE for more information. Thanks for your support! Check out article headlines below featured in this month’s Prostate Cancer News You Can Use. 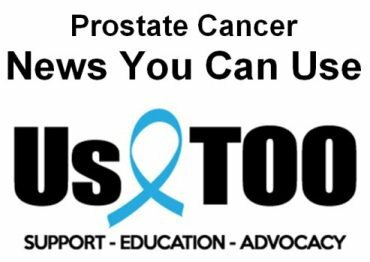 Watch for the July issue of the Hot SHEET newsletter from Us TOO in a few weeks and another update on prostate cancer News You Can Use in about one month.